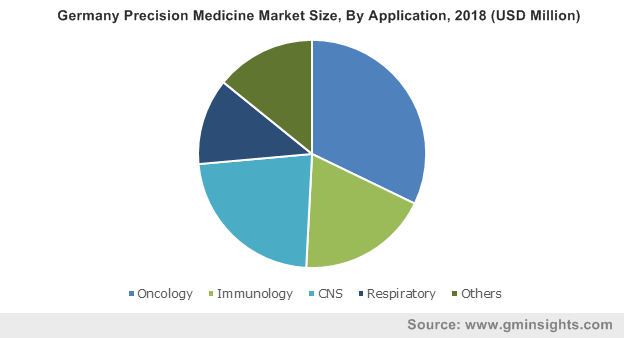 Recent advancements in applications of big data technologies for accurate detection of diseases will positively impact the precision medicine market share during the forecast timeframe. Big data analytics are useful in chronic disease management. Additionally, the software also provides enhanced clinical workflow. Introduction of such software that typically has enhanced capacity to store huge amount of genetic data ensuring faster patient recovery will prove beneficial for the precision medicine industry growth. Moreover, key industry players focus their efforts on upgrading software that supports drug discovery processes. For instance, in 2018, GE Healthcare collaborated with Roche that helped them to develop digital integrated platform for critical care treatment and oncology. Software specifically designed to develop precision medicines utilized in treatment of chronic diseases as well as genetic diseases ensuring quick patient recovery will augment the precision medicine market size in forthcoming years. Growing adoption of big data analytics and gene sequencing utilized in gene therapy will escalate precision medicine market growth in the near future. Gene therapies are utilized to treat genetic as well as chronic diseases according person’s genetic makeup. Development of Human Genome Project and advancements in cell-biology has further improved the gene therapy treatment patterns propelling the business growth. In addition to aforementioned factors, rising burden of metabolic diseases including diabetes and hypothyroidism will escalate the demand for gene therapy thereby, driving precision medicine market demand during forecast timeframe. However, violation of privacy rule and misinterpretation of genetic and health data may hamper business growth. Drug discovery segment in precision medicine market was valued at USD 10.5 billion in 2017 and high segmental revenue can be associated with increasing prevalence of cancer and other chronic diseases. Key pharmaceutical companies such as Novartis and Lupin are involved in the drug discovery process that enable efficient treatment for life-threatening diseases. Pharmaceutical as well as biopharmaceutical companies utilize bioinformatics software to develop novel drugs that are customized according to patient’s genome. Availability of technologically advanced platforms for facilitating the process of drug discovery will trigger segmental growth. Gene sequencing segment will experience 11.7% CAGR during the forecast timeframe. Gene sequencing techniques offer relevant information about patient’s genome that enables faster drug discovery process. Gene sequencing techniques also initiate the process of pharmacogenomics that determines the amount of medication required by a particular person. Increasing prevalence of genetic diseases will spur the business growth in forthcoming years. Immunology segment accounted for 18.9% in 2017 and is expected to show similar growth trends over the upcoming years. Utilization of data obtained from advanced platforms such as bioinformatics and big data analytics will foster the immunotherapy proceses. Human genome data obtained for immunological processes is complex. Big data analytics is preferred to segregate the obtained data and simplify it to develop immunological therapies. These software enables availability of vaccines and precision medicines altered according to person’s genome that elevates the segment growth. Oncology segment in precision medicine market was valued at USD 15.4 billion in 2017. The segment will grow enormously owing to rising cases of cancer. According to American Cancer Society, currently as of 2018, 1.7 billion new cases of cancer are diagnosed in the U.S. Furthermore, availability of genome sequencing techniques will promote the drug discovery process for cancer treatment that will boost the segment growth in the foreseeable future. Healthcare IT companies’ segment was valued at USD 13.0 billion in 2017 and is expected to have substantial revenue size in precision medicine market during the forecast timeframe. These companies rely on revenue specifically driven by the sales of data management systems utilized in storing the genetic information. For instance, Sophia Genetics in Europe develops systems and software that facilitate the process of discovering precision medicines escalating segmental growth. Diagnostic companies segment accounted for 18.5% revenue share in 2017. Diagnostic companies are involved in providing solutions that bridges the gap between technology and clinical needs of the patients. Growing technology adoption rate by the diagnostic companies will ensure high quality of the medical diagnostic devices utilizing the software for data storage. Aforementioned factors coupled with increasing R&D efforts by industry players such as Roche Diagnostics will foster segment growth. U.S. precision medicine market will experience 9.7% CAGR and is expected to grow substantially during the forecast timeframe. Increasing geriatric population suffering from chronic diseases such as cancer will positively influence the business growth. According to Fact Sheet, the geriatric population in America is estimated to increase to 98 million by 2060. Majority of the geriatric population suffers from chronic diseases that should augment the U.S. precision medicine industry growth in forthcoming years. China precision medicine market was valued at USD 2.5 billion in 2017. Growing burden of genetic diseases in China will propel the demand for gene therapies. Gene therapies are relatively expensive and hence, majority of the treatments are reimbursed. Chinese population is covered under health insurance. Moreover, the Chinese government implements certain initiatives that prove beneficial for business growth. For instance, according to BioWorld, Chinese government has undertaken initiatives that includes funding that facilitates the development of precision medicines impacting the China precision medicine market growth positively. 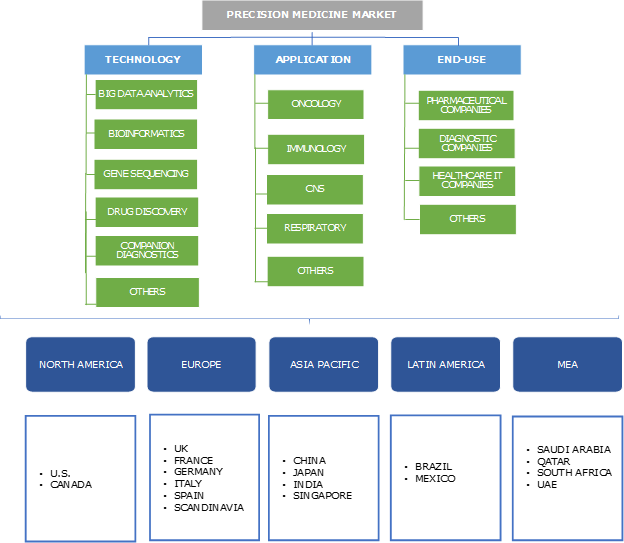 Prominent industry players operational in the precision medicine market include Biocrates Life Sciences AG, Eagle Genomics Ltd, Ferrer inCode, Intomics, Laboratory Corporation of America Holdings, NanoString Technologies, Novartis, Pfizer, Qiagen, Quest Diagnostics, F. Hoffmann-La Roche, Silicon Biosystems, Tepnel Pharma Services, Teva Pharmaceuticals. These industry players implement strategic decisions that renders them with competitive advantage. For instance, in January 2018, Roche entered into collaboration with Syapse. Sypase is a leading precision medicine company with extensive product portfolio. This collaboration will broaden Roche’s precession medicine portfolio that will enhance company’s revenue share in the market. The history of precision medicine market can be traced back to the development of Human Genome Project. On initiation of Human Genome Project, medicines for diseases were manufactured based on principal of specificity that ensured targeted therapy. According to an article published by U.S. News & World Report, precision medicine market has evolved since 2007 with respect to genetics. Currently, the market has witnessed advancements due to development of specialized software enabling enhanced patient engagement and data management. Artificial intelligence is integrated that enables platform analysis to provide medical insights. Also, utilization of blockchain technology in developing precision medicines ensures effective data safety and data management. Moreover, analytic software facilitates pharmacogenetic process that will speed the drug discovery process enhancing precision market industry growth. Furthermore, precision medicine industry is highly regulated that enables availability of upgraded techniques ensuring substantial industry growth.